Series devoted to saving treasured heirlooms from the scrapheap. In Chatsworth House, Derbyshire, Eric Knowles sets his team of brilliant restorers another series of challenges. so maybe they can be sold at auction and make a bit of money along the way. home to the Cavendish family for over 450 years. We've got paintings, dolls and arts and crafts bed heads all coming through the gates. For me, stepping inside this majestic house is like entering a sweet shop. But keeping everything in mint condition is a restoration marathon. and the restoration programme continues to this day. We'll be finding out more later. Here at Chatsworth, our restorers already have their hands full. Coming up, an 18th century clock, but not to everyone's taste. My wife says of this clock, she'd rather have a corpse hanging on the wall. Roger's got a family treasure. But it's gone to pieces. A terminal case if ever I saw one. Well, it was under my grandma's bed, wrapped in a curtain. Now I think the curtain might be worth a bob or two. But can it be restored for auction, or taken home? And will it make any money under the hammer? Well, this is obviously a clock that was designed to get noticed. It's seen ravages of time, and I think it's had a little bit of treatment over the years. Well, it's fallen off the wall at least twice. You can see from the damage. -Yes. So it hasn't obviously done it any good. It's good looking clock. What I like about it is this lacquered finish. -Date-wise, I'm thinking it must about around about, what, 1760, maybe 1770? 'The tavern clock got its name as a result of the Government's clock tax. -I'm assuming the mechanism works. I think you might be getting near to £1,800, or possibly a couple of thousand. then the price tags are in the sort of £4,000 to £5,000 bracket. you've got to give it back its dignity, cos it's looking very tired. that she'd rather have a corpse hanging on the wall than this clock. So I suppose it does need some attention. -I detect from that, your wife's not a clock lover? She won't have a clock in the house. Really? So where are you keeping it today? It's in the hotel that I own in Bakewell. It's amongst 50 other clocks, I have about 50. Is it something that you're considering placing at auction? Well, it keeps good time. -I rather like this one. -It's going to stay and earn its keep. -What we'll do is we'll get our restorer to put a big rubber tyre underneath it here. Rod Titian has worked in palaces and for royalty so I suspect he won't go for my tyre suggestion. this battered old tavern clock is in the safest of hands. Well this is actually a chinoiserie clock. The decoration is a replica, really, of the Chinese decorative work they used to do on lacquer pieces. And it's the European counterpart. There's a lot of decoration missing here, and it's actually raised and slightly rough. That could benefit from taking down, and then I can replace the decoration where it's actually scarred as well. You can see all the scarring from different angles, and areas like here, which actually are bubbled. that I would just remove that completely, and then just touch that in. So, I think, breaking down the costs, if we were to do the initial section at the front here, £400. To do all the other areas that I mentioned, a further £150. -So it takes us to about £600 or so. -Well I would agree with that. I think it's first class. Do you think your wife is going to love this clock any more? She'll never see it. She never comes to the hotel. OK. You communicate by mail or what? I don't think we need to go into this any further, do we? 'but persuading Mrs Donegan to give this beauty the time of day will be a real toughie. 'I fancy it's going to take more than gold lacquer and a steady hand to win her round. 'And here's a real test for our ceramics restorer. 'A wonderful, but sadly very damaged early 20th-century bone china pot made by Royal Worcester. 'Luckily, ceramics guru Roger Hawkins is just the man for the job. 'and will be as upset as I am to see this majestic pot in such a state. -Now this you have to tell me about, because this has had a hard life, hasn't it? and all the old glue around there has been done. -Well, this is a picture of my grandparents. And when we cleared their house out, they found this. And then it was at my parents' house, and I always liked it. I remember when my parents got it, it was broken inside, and then gradually the lid got broken. -that suggests to me it's around 1915 period. The Worcester porcelain factory has been in production since 1751. In the 1900s, the company employed talented ceramic artists like Kitty Blake. Her painted flower and fruit pieces are highly sought-after. Have you any idea of what its value is? I did see it in the guide, and it was between £150 and £200. If it were in perfect condition, now, the retail value may well be around that. If you were to put in auction like this, I would suggest a valuation of nothing. -Unfortunately, it is just too badly damaged. However, I can restore this completely. I can put it back into condition as if it were perfect. The only problem with that is it's just a pure economic question. there is a lot of work in doing the lid on its own. it looks to me like it would be around sort of £350 to restore that. Is it something that you're going to keep or would you want to sell it? I do want to keep it, because I haven't got many mementos of my grandparents. -So, something you think you will go ahead with having done? Trish is putting family pride to the fore. a price tag it could never hope to reach at auction. this little piece of family history is priceless. So there are future generations counting on you, Roger. Good luck making this whole again. Coming up, can we revive this tired Victorian writing box? I'm making this look easy. It's really hard. And join me for a behind-the-scenes peek at the restoration of this beautiful historic home. You've got a motley selection, and some of them are in desperate need of a vet. They're not my style. My mum would have said, "Oh, sell them and buy something that you like". Well I can see from this missing piece of fret, that this object's been damaged generations ago. -How many generations has it been in your family? that it was given to an aunt of my grandfather's in 1881. I think it was made somewhere either in northern Italy or the Swiss area. It's got a Tyrolean feel. -It's obviously somewhere where they've got a lot of snow because they're on a sledge. Where's this been kept over the successive generations? Well it was under my grandma's bed, wrapped in a curtain. and it's under our bed, wrapped in the same old curtain. Now, I think the curtain might be worth a bob or two. -As it is, it's in such a state that maybe it's worth £100 or £150 maximum. it'll bring it back into a value range which may be nearer £300 or £400. 'Good news for John and Pat, who are looking to sell at auction. 'But can it be given a much-needed facelift? 'Furniture restorer Tim Akers thinks it can. It's a beautiful piece of walnut. It absolutely glows, doesn't it? It's wonderful. And it's got the most wonderful grain to the side. I love the pierced fretwork on it. It's just a beautiful thing, a really beautiful thing. Obviously you've got a certain amount of water damage to the main panel, which is a shame. With regards to what else we need to do to it, the main area of damage is the fretwork. Let's have a look. for at least 50 or 60 years longer than the piece that's been detached, because you can see the difference. The work involved is to repair the fretwork, glue the joint back, do something with the water mark. OK. So what sort of price are we talking about for that work? -£150, I would have thought. -So, it seems like a good price to me. -It sounds good to me, that, yes. -and when it goes to auction, let's hope we get you a special price. 'could help John and Pat double their money at auction. with over a mile of painted walls and ceilings. commissioned in 1690 to honour William III, has been the scene of many dramas. In 1930, the ceiling threatened to come crashing down and reduce all this to rubble. but by 1990, the paintwork desperately needed restoring. and just the accumulated dirt from hundreds of thousands of visitors. of a very thorough inspection and then a clean. It was a monumental task costing over £100,000, and just finding time to do it wasn't simple either. and the conservators were working high up above the public who were walking underneath. The work illustrated just how tricky painting these murals would have been, not to mention restoring them. to slowly clean layers of varnish and dirt off. You could see people thinking, "I can see why this is very lengthy, very expensive, very specialist,"
and maybe developing a greater appreciation of what it takes to look after a great historic building. when we bring your tired and broken antiques back to life. that 18th century clock has undergone hours of surgery. He's refilling the many cracks and carefully remodelling the intricate Chinese decoration. The next stage is quite intricate, which is what I'm doing now, which is why my breath is very slow. It's because there's a lot of concentration that's involved when you're putting on lines. was that it was actually done a little bit on the kind of primitive side, for the want of a better word. they're a bit wavy, they're not as straight as I would have done them myself. with the decoration of the actual piece itself. So, I'm having to be not as perfect as I might like to be, basically. And that's tough for someone who's used to absolute precision. Rather you than me, Rod. Pieces like this are so special. Every inch of lacquered paintwork reveals the breathtaking skill of the person who crafted it. And craftsmanship is what ceramics restorer Roger Hawkins is about to demonstrate by the potful. for a bit of serious reconstruction work. Roger will have to make the missing pieces by hand. He starts by making an impression of the latticework in modelling putty, then prepares the hole for filling. so that when the filler goes in, it will adhere. But like many jobs in restoration, this is trial and error. Hopefully emphasis on the word "trial" and not the word "error", but we will see. It certainly looks more trial than error. Now for the tricky bit, filling in the hole. make it fit, and because it's flexible, it will. And I'm now going to press into that some of this filler. being careful to wipe away any excess. Once set, it's time to see if it's paid off. If I pull this off, we'll see whether my filler has formed the shape. Impressive stuff. But it's a long way off making it as good as new. for the less opulent surroundings of his specialist workshop. and there's a valuable tip for all you glue-it-yourselfers. "well if I don't, I'll lose the piece". But please don't do this. You don't do the piece of furniture any favours. Instant quick-drying glue is irreversible, a big no-no when it comes to restoration. We should always allow for future work. Tim's using a traditional type of specialist glue. Injecting it with meths means it can be taken apart again if it needs to be in the future. He's using not one, not two, but six clamps to secure the glued fretwork. but he can't apply too much pressure. so I can't just put masses of pressure on. I've got to get it in place, all the clamps in place, pressure on, before the glue cools down. I've got to work quite fast. To about there. I almost have to mentally prepare myself for this. Even after all the years I've been doing it. Everything's in place. I really only have one chance with this. Let's go. To remove the excess glue, I'm going to put a little clamp there. One at the back. Come on, quickly. This is where I need more hands. And then a huge weighty clamp to go on top, to give it the downward pressure. Tim will have to wait eight hours to discover whether he's been able to create an invisible mend. Back in Derbyshire, our Restoration Roadshow is drawing to a close. time to reveal their handiwork. One man who could certainly use a brew is Rod Titian. He's worked up a thirst replacing missing sections of gilded decoration. But it's time, please, ladies and gentlemen, and I can't wait to see what its owner, David, thinks. I don't mind telling you that I've been watching Rod from afar and he's been a model of concentration. that you might have bitten off a bit more than you could chew. Decoratively there was a lot to do, a lot to put back. The decoration was quite fine in places as well. so in general I'm extremely happy with the way it's gone. All right, well, that's one happy bunny. -I'm looking for two happy bunnies. Shall we just pull this? So, feast your eyes on what was, quite honestly, a bit of a wreck of a clock. You really have done a cracking job. No doubt about it. I didn't believe for one moment you could do anything like it. This bit here, for example, I think it's absolutely fantastic how you've replaced it. 'looked like it had knocked back one too many. What you've resisted, doing, Rod, is actually putting that tyre on the bottom that I suggested. This is a balancing clock at the best of times. One thing I did do was just to check the stability of the plate at the back where it hangs from. -And it is actually nice and stable, so it can be used, it can be hung in that way. I hate to say it, but you've done a first-class job. Well, that's very good of you. Initially, we were saying it was worth maybe £1,800 to £2,000. I think it's fair to say, Rod, that we're now looking at a clock that is going to be worth what, go on? Well I would say very close to £5,000, £6,000, if it were to go to auction. I'll take four now, if you want to! -We're tempted, but it's an offer we have to refuse, isn't that right, Rod? -Even though your wife would probably be very happy. -Absolutely delighted. It's absolutely first class, thank you very much. But can we make it two? Remember that tired Royal Worcester pot brought in by Trish Pickering? remove all the old glue, stick it back together and fill in the holes. And now it's the moment of truth. Will it be £350 well spent? So you made that decision, to spend some money, a fair amount of money, because it was a complicated job. But let's just see the end result, shall we? Are you ready? Yes, I'm actually... I can't wait to see it, actually. Well hold on to your hat, because here's the big reveal. Wow. Is that the same pot I brought? I can't believe it. Well, I'm actually speechless because I didn't realise that it would be restored so well. 'Before, this pauper of a pot didn't live up to its royal name. -It's a regal little pot, is that. -It is. It's very pretty, isn't it? I mean, that adds to the perfect pedigree, I can tell you. 'And thanks to all his hard graft, this good-as-new family heirloom can be admired for generations to come. 'So, it's smiles all round here in Derbyshire. We've seen some fascinating collectibles here today. 'and David's stunning 18th century tavern clock with its gilding now fully restored. -Kept under the bed for how many years? 'and John and Pat Spate are hoping their writing box will find a buyer. 'But first, they need to be reunited. Remember the state it was in? 'Well Tim's been toiling away in his studio, treating the water stains and fixing the fretwork. Have you got any thoughts as to whether you might be keeping it or selling it? I don't want it under the bed for another 90 years. So if it's going to go to a good home, that's fine with me. It was a bit tatty, so I'm looking forward to seeing what he's done, but I've got to be sensible. OK. Well shall we see whether or not they are great expectations or what? I love doing this bit, I really do. -A feeling of power. OK.
'Before, this glorious Victorian writing box was nothing to write home about. Now it's turned a page. 'you'd be hard pressed to find the hint of a break. Which was the broken fretwork? -That one. Yes. Oh, that's lovely. I think it's absolutely beautiful. I think he's done a cracking job. Unfortunately we haven't got the room and we are downsizing, so, I think it must go to auction. -No, you can't have it. 'Well that's decided then. I like a man who knows his own mind. 'It's all down to the bidders now, but it's certainly too good a piece to just give away. 'As it was it, it wouldn't have been worth more than £100 to £150. 'as they could now be looking at a price tag of between £300 or £400. 'you will have commission and other charges to pay, so be sure to check with the auction house. 'Everything that's been restored should be noted in the catalogue. -We're getting close, aren't we? Have we got some tension there? Are we feeling a little bit... Yeah? Well, I've been watching people pick it up and have a look at it. You've set a reserve, haven't you? -It's worth three... I mean, I just know, it's worth £300. To use a well-worn phrase, it's ready to go. The 19th century continental marquetry wrap desk. -Where is it? There it is. -He's what I call a Formula 1 auctioneer, this fellow. I think he's doing about 150 lots an hour. He can talk the talk, as they say. Anyway, here we go. I can start here at £270. 280 do I see anywhere in the first? 280, 290, 300? Has it at 300. 300, come on, it's worth more than that. Come on! At £300 in the centre, 310 may I say? At 300, 310. Oh, look, there we go. There's another bid. 320. It's a super thing. 320? At 310. All done now, it's selling. It's done now. I'm relieved it's all over now. You know, I know I had second thoughts about selling it, but I know it had to go. We hadn't got the room, so that's it. -And I can get rid of the curtain it's been in for 80 years. 'Well, I'd like to have got a little more for it. 'I certainly think Tim's skill deserved a higher reward. because we were certainly on the money. So, join us again for another amazing transformation here on Restoration Roadshow. In the elegant setting of Chatsworth House, Derbyshire, Eric Knowles sets his team of brilliant restorers another series of fiendish challenges. 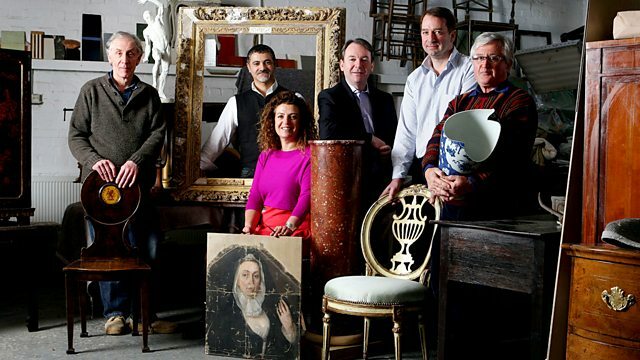 But can the restorers bring back to life the neglected and broken items brought in by the general public? Furniture restorer Rod Titian attempts to save an extraordinary 18th century tavern clock that’s suffered the ravages of time. Tim Akers wonders if the writing’s on the wall for a lovely Victorian desk, and Roger Hawkins has to draw on all his experience to bring a highly sought after Royal Worcester vase back from the dead.